BONN, Germany, Nov 15 2017 (IPS) - “Five years ago, when we first started talking about including gender in the negotiations, the parties asked us, ‘Why gender?’ Today, they are asking, ‘How do we include gender?’ That’s the progress we have seen since Doha,” said Kalyani Raj. Raj is a member and co-focal point of the Women and Gender Constituency (WGC) of the United Nations Framework Convention on Climate Change (UNFCCC). Established in 2009, the WGC is an umbrella group of 27 organizations working to make women’s voices and rights central to the ongoing discussions within the UNFCCC and the climate discussions known as COP23 in Bonn. On Tuesday, as the COP observed Gender Day – a day specifically dedicated to address gender issues in climate change and celebrate women’s climate action – UNFCCC had just accepted the Gender Action Plan, a roadmap to integrate gender equality and women’s empowerment in all its discussions and actions. For WGC and other women leaders attending the COP, this is a clear indication of progress on the gender front. “For the first time ever, we are going to adopt a Gender Action Plan. It’s very good and over one year, it will be a matter of implementing it. 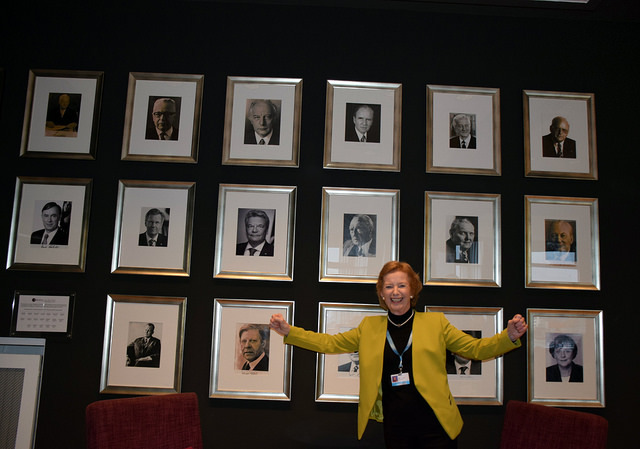 So that’s where we are,” said Mary Robinson, former president of Ireland and former Special Envoy of the UN Secretary General for Climate Change. The creation of a Gender Action Plan (GAP) was agreed upon by the countries at last year’s conference (COP22) in Morocco. All over the world, women face higher climate risks and greater burdens from the impacts of climate change. Yet they are often left out of the picture when decisions on climate action are made. The aim of the GAP is to ensure that women can influence climate change decisions, and that women and men are represented equally in all aspects of the UNFCCC as a way to increase its effectiveness. The GAP is made of five key goals that are crucial for improving the quality of life for women worldwide, as well as ensuring their representation in climate policy. These range from increasing knowledge and capacities of women and men to full, equal and meaningful participation of women in national delegations, including women from grassroots organizations, local and indigenous peoples and women from Small Island Developing States. Gender balance in all aspects of climate change policy including all levels of UNFCCC. 100% gender responsive approach in technology transfer and development. The adopted draft, however, is a much watered-down version of the draft GAP that the GEC submitted. It has omitted several of the demands, especially on including indigenous women and women human rights defenders in the climate action plan. Not everyone, however, is taking the omissions in the GAP quietly. At Tuesday noon, representatives of over a dozen women’s organizations from Latin America, Africa, the MENA region and Asia gathered at Bula zone 1 – where the negotiations are taking place and held a protest. “We are here because we want to tell the parties that women human rights defenders are legitimate and critical actors not only in SDG 5, but all the SDGs including combating climate change and all areas of 2030 agenda and Paris Agreement,” said a protester as others nodded in silence, their mouth sealed with black tape. Prior to the protest, however, Lina Gualinga, an indigenous leader from the Kichwa tribe in Ecuador shared some details of how women environmental activists feel. “The representation of women environment and climate defenders is minimal at the COP as the UNFCCC has built a firewall around it. So, very few women can actually be here and be part of the COP,” she said. “In the meantime, the language of the negotiations is drafted and shaped leaving no room to address our concerns. For example, what is sustainable development? For us, it’s nothing but clean water, fresh air, fertile land. Is that reflected in the language of the COP?” she asked. Besides the continuous disappointment over human rights and indigenous issues, accessing finance has emerged as the biggest hurdle for women climate leaders. According to Robinson, the number of women who are getting climate finance is shockingly small. “The latest figures by OECD (Organization for Economic Co-operation and Development) shows that only 2 percent of the finance is going to women in the grassroots and southern groups. Only 2 percent! Its tiny. And yet that is where an awful lot of climate work is taking place, where women are trying to make themselves resilient,” Robinson said. There are three simple ways to solve this, she said: One, increase local funding. Two, simplify the process to access climate. And three, train women in new, green technologies. Citing the example of the Barefoot College in India – a government funded and NGO-run institution that trains women from developing countries in solar technologies before they become “Solar Mamas” or solar entrepreneurs – Robinson said that trainings like this are a great way to include women in climate action at the local level. “This not only builds their capacity to be more climate resilient, but also helps them become economically empowered,” she said, before admitting that more such initiatives would require more direct funding by local institutions. White the central debate is on mainstreaming gender in the core process of negotiations, some also want to draw attention to the low representation of women in the conference. At the 2015 Paris summit, just over 38 percent of national delegations were women, with Peru, Hungary, Lesotho, Italy and Kiribati among the most balanced delegations and Mauritius, Yemen, Afghanistan and Oman the least. This year, some countries such as Turkey, Poland and Fiji have 50 percent female delegates while three countries – Latvia, Albania and Guyana – have sent all-female delegations. But the average percentage of female negotiators at country delegations is still 38. Several countries, including Somalia, Eritrea and Uzbekistan, did not include a single women in their delegations. Noelene Nabulivou, an activist from Fiji, said that it’s time to seriously fill the gender gap at the conference. “If we are asking for equal opportunity, why can’t we ask for equal participation?” asked Nabulivou. Meanwhile, Kalyani Raj thinks that quotas could limit the potential scope. “We want a balance, but at the same time, why limit ourselves to a mere 50 percent? It could be anything!” said Raj. The first report to evaluate the progress on the implementation of the Gender Action Plan will be presented in November 2019. Are rich and poor nations in the same climate summit?